In the minds of artist Mary Edna Fraser and geologist Orrin H. Pilkey, their two disciplines do not seem so far apart. Their first meeting in 1993 occurred when Mary Edna accompanied Orrin on an excursion to Cape Lookout National Seashore to do some “ground truthing” with his students. They soon realized that their passions for barrier islands were equal, although seated in different bodies of knowledge. Over the roar of the Duke University research vessel, they shook hands. Mary Edna Fraser is an internationally recognized master of the textile art of batik who has flown the eastern seaboard of America and many foreign coastlines in her search for pristine environments that form the basis of her art. (For an explanation of batik art, see Mary Edna’s website). Together, Fraser and Pilkey bring an understanding of coastal geology and global change to the public in a way that is scientifically astute and visually intriguing. 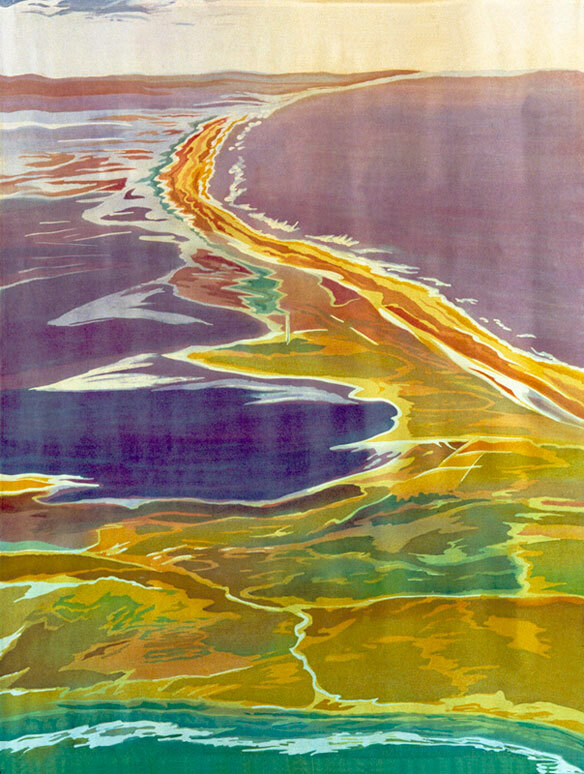 North Carolina native Mary Edna Fraser’s first task for Pilkey was to photograph Core Banks as the basis for her batik on silk, seen here. Her father, Claude Burkhead, Jr., piloted the family’s 1946 Ercoupe to the Outer Banks on a mission to supply Pilkey with aerial images in February of 1995. Thus began a continuous collaboration, publishing of A Celebration of the World’s Barrier Islands in their critically acclaimed 2003 text from Columbia University Press. Numerous exhibitions and lectures combining Pilkey’s text and Fraser’s art have followed since their meeting, beginning with “Aerial Inspirations” at the Smithsonian National Air and Space Museum in 1994. Their current efforts are directed toward Global Change: A Primer, an upcoming publication by Duke University Press, co-authored by Orrin’s son Keith Pilkey. Orrin H. Pilkey gives insight into Core Banks in their book, A Celebration of the World’s Barrier Islands: “Core Banks, shown here, is part of the Cape Lookout National Seashore and is a rare natural laboratory to study barrier island migration. During Hurricane Dennis, the island migrated a foot or so toward the mainland….Most of the overwash sand penetrated only a few tens of yards, but the occasional large wave combined with a high tide and high storm surge level to push sand completely across the island and into the south behind. The net result was an island with a slightly higher average elevation than before the storm….What happened on Core Banks was a tiny step in the island’s long-term response to sea level rise. Because the ocean-facing beach retreated a bit and the mainland-facing lagoon side of the island built out a bit into the lagoon, the entire island moved landward ever so slightly.”The island that is eroding on both sides did not disappear, but instead was reinforced and strengthened. Increased storminess, and even a subtle change in sea level rise, will certainly continue to cause economic hardship on developed barrier islands around the world. These islands continue to exist because they are able to respond dynamically to change. They have persisted through great dips and swells in sea level. In conversation on the beach, Orrin has reminded Mary Edna that erosion only becomes a problem on these islands when man’s structures become threatened. And, as we face an unstable future, it is wise to avoid building here, where the first effects of global change are already being seen. Fraser and Pilkey’s upcoming exhibition, Our Expanding Oceans: The Blending of Art and Science, at the North Carolina Museum of Natural Sciences (June 2011 – May 2012) presents the largest collection of Fraser’s batik art ever on display. It will show a spectrum of history between Mary Edna Fraser and Orrin H. Pilkey with a focus on melting ice and rising seas. Expect to see continued coverage of Fraser and Pilkey’s endeavors published by coastalcare.org on a monthly basis. 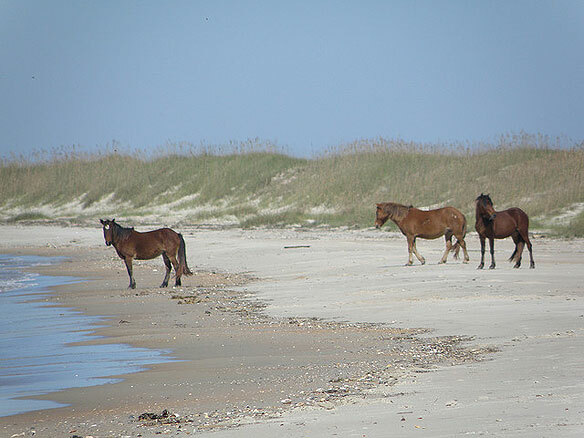 Wild horses often emerge from the interior dunes of Shackleford Banks to wander along the ocean shore. The beaches of Core Banks Core Banks’ beaches are a vanishing breed. They are almost purely natural with no contamination or dilution by artificial (nourishment) sand. The beaches on islands to the north (Ocracoke) and to the south (Shackleford Banks) are also unnourished although a lot of beach bulldozing has gone on at the north end of Ocracoke to protect the Highway 12. All these island beaches are pristine because they are part of the US National Seashore System. The sand on Core Banks is primarily quartz with a small amount of plagioclase feldspar (5% plus or minus) and some heavy minerals that form the black sand patches on this beach. Occasionally there are small patches of purple sand which form when the winds are just right to whisk away the other heavy minerals leaving a concentration of purple garnet behind. There is a fair amount of ground up shell material in the beach sand (less then 10% as a rule) that gives the beach a light yellow brown coloration because the shell is stained brown from iron oxide. – The adjacent continental shelf, pushed up by waves. – Longshore transport mainly from the north. – Storm overwash when sand is deposited on the island by storm waves. – Offshore movement of sand during large storms. – Alongshore transport of sand in a north to south direction. Sand is transported dominantly from north to south on the beach, eventually ending up at the tip of Cape Lookout where the sand travels seaward, out on to the Cape Lookout Shoals. Most of Core Banks’ sand does not turn the corner at the cape and continue downcoast.